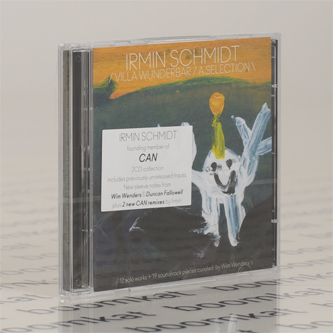 Extensive, cherry picked two CD set presenting Can's founding member on one disc of solo work and one disc of soundtrack music curated by Wim Wenders - including two exclusive new remixes of Can tracks. CD1 spans 30 years of Schmidt's solo compositions ranging from strange, theatrical experiments in '90s D&B ('Fledermenschen', 'Ensemble Joy') to expansive avant-garde incursions ('Burning Straw In The Sky') and jazzy, pop-wsie exotica ('Villa Wunderbar') and noirish psych-pop ('Kick On The Floods') and an unreleased extract of his ballet score for Youri Vàmos. Acclaimed German filmmaker Wim Wenders selects 19 soundtrack pieces for CD 2, illuminating outstanding compositions such as the brooding, symphonic, Hermann-esque 'Quattrocanti (Dream Theme, No.4')', the Badalamenti-esque jazz noir of 'Fresco & Finale (Flavia Theme III & IV)', and the woozy electronics and sax of 'Morning In Berlin' alongside his remixes of Can tracks 'Alice' and 'Last Night Sleep'.